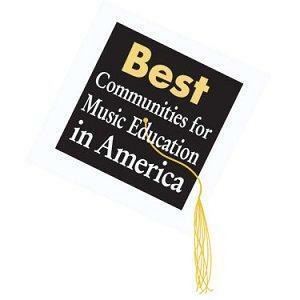 Quaker Valley was named one of the “100 Best Communities for Music Education” by the National Association of Music Makers (NAMM) for the 14th year in a row in 2018. The criteria used in judging music education included the percentage of music courses that are required versus elective, class sizes, the size of the music staff, as well as community resources that support music and the arts. 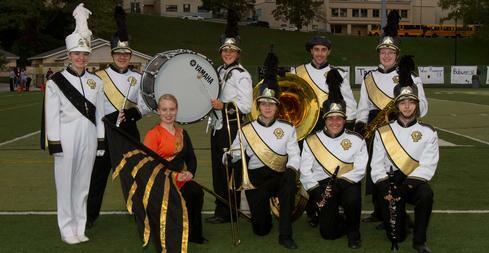 Quaker Valley students continue to compete and excel at the local, regional, state and national levels. Elementary students are “tuned in” to music beginning in the first grade. Music exploration and learning is achieved through singing, playing of classroom instruments, movement, and listening to music. Students are exposed to a variety of musical styles including traditional folk songs, patriotic music, and multicultural music. Creativity is constantly fostered, encouraged, and celebrated. Recorder instruction begins in third grade, and students may then choose instrumental instruction (band and strings) during the school day in grades four and five. Band and orchestra students build musical skills through the practice, rehearsal, and performance of skill-appropriate and challenging music. Small-group lessons occur during the school day as well as an ensemble period for both band and orchestra. Choral music begins in grade five for all students, and students sing unison, canon, two-part, and three-part treble music. A variety of choral, band, orchestra, and co-curricular drama productions are performed throughout the school year. A strong quality of the Quaker Valley music program is that all middle school students have the opportunity to participate in an ensemble – band, chorus, orchestra – throughout the middle school years. Chorus students learn and sing a variety of repertoire in two, three, and four parts. The practice of proper vocal technique, as well as analyzing and evaluating the structure of vocal music, are main tenets of the sequential choral program. The Band program allows students to continue their refinement of musical skills (advanced elementary, intermediate, and advanced intermediate) through the practice, rehearsal, and performance of complex band music. Students discuss and constructively comment on their own performances and on the performances of the band. Students in string orchestra become producers and consumers of music through practice, performance and evaluation. Major emphasis is placed on string technique, music theory, and musicianship. The Orchestra offers an audition only, elite ensemble that meets weekly after school. The ensemble’s purpose is to perform for the school and surrounding communities. The orchestras also offer a before school program, "The Strolling Quakers." Any string player in the district is welcome to come and learn strolling strings music and choreography. Guitarists, pianists, and drummers are also welcome. High School students are provided many options to take elective music classes. Concert Choir students learn and sing a variety of repertoire through which proper vocal technique, choral technique, and music reading are taught. Emphasis is given to age appropriate musicianship/aesthetic response including rehearsal and concert etiquette, and responsibilities associated with membership in a performing organization. Vocal Ensemble is a separate after-school choral offering. Band students may participate in Concert Band and Marching Band. Strings students may enroll in String Orchestra, which includes Symphony Orchestra in the spring. Both Concert Band and Strings students have the opportunity to perform in small ensembles and in the community. Interested students may learn about the mechanics of music by taking up to three different levels of Music Theory, including Music Theory I, Music Theory II, and AP Music Theory (Music Theory III). Keyboard Lab and Stage Lighting and Sound are electives also offered.